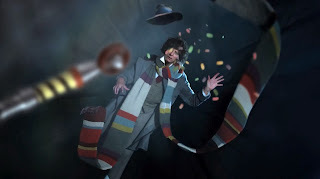 While I was researching a vintage pattern I came across something of interest to the Fourth Doctor’s costume. 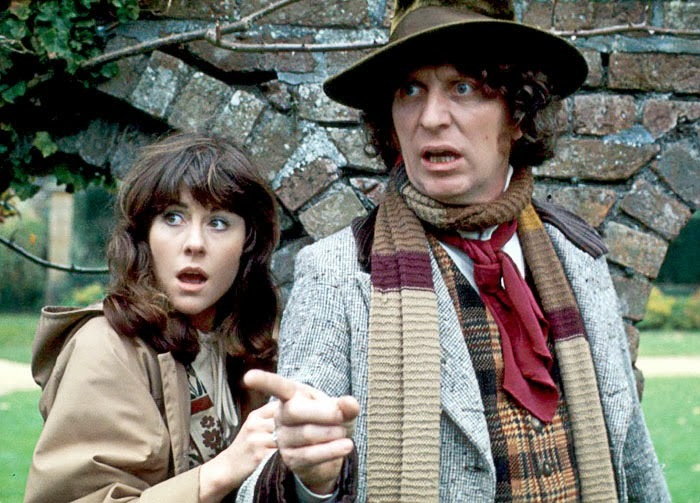 At various times during seasons thirteen to sixteen Tom Baker sported varying neckwear, tied in a knot at the neck. These are known as Ascot Ties and my book The Modern Tailor Outfitter And Clothier dating from 1949 describes how they are cut and tied, accompanied by a series of step-by-step diagrams. 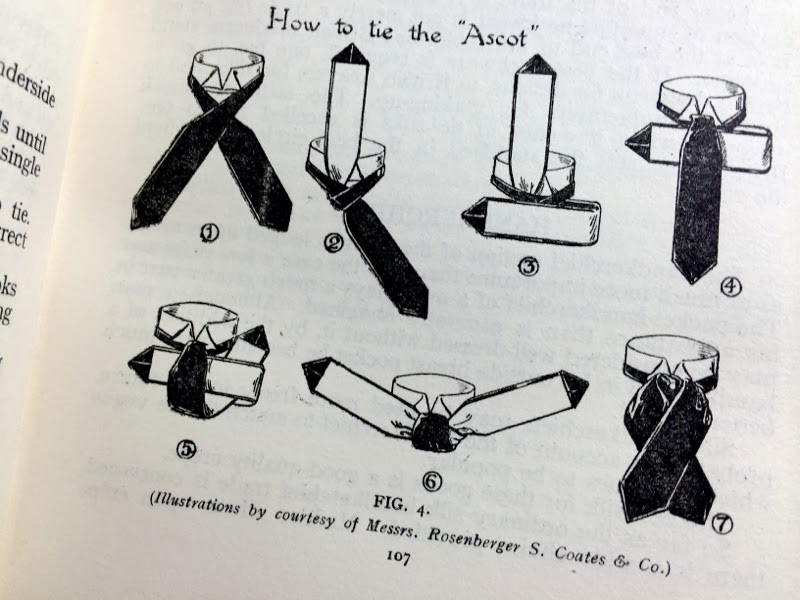 Obviously this is not exactly the same cut as screen worn, but I thought readers might find this interesting period-based reference material. This week has seen the BBC release a fantastic new trailer celebrating the full 50 years of Doctor Who. In one way or another all eleven Doctors are represented, some only fleetingly others more visibly. 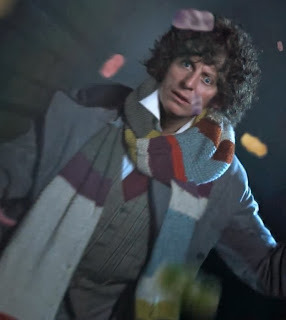 It goes without saying that the Fourth Doctor is seen quite prominently at around 20 seconds into the one minute trailer, floating around surrounded by spilt Jenny Babies and an erroneous third Doctor sonic screwdriver. But what has stirred up some debate is the clothes The Doctor is seen wearing. 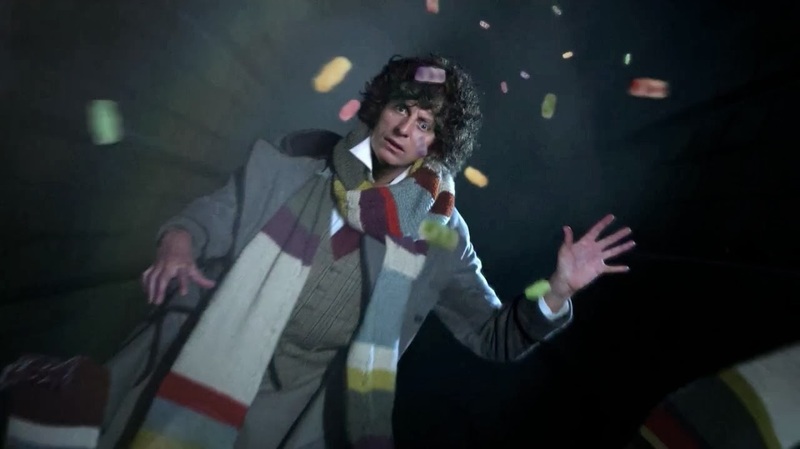 The image has been achieved by compositing Tom Baker’s face onto someone wearing the costume. The coat is clearly the Power Of Kroll frock coat, known also for its appearance in City Of Death. The waistcoat appears to have a tweed checked pattern, but is not the classic version he is seen in many episodes. But the scarf, as ever, fires up the blood of the Fourth Doctor fans. 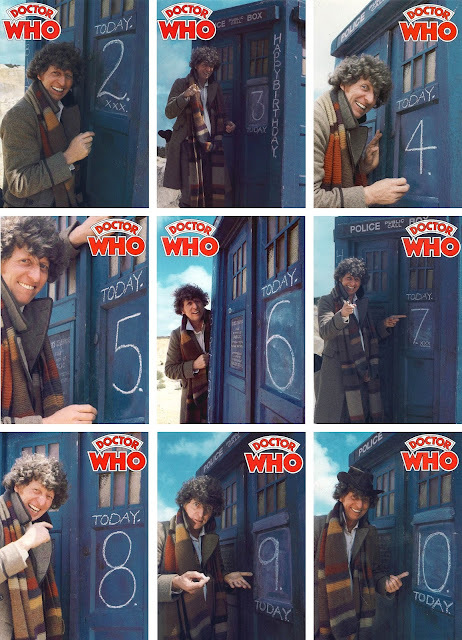 It’s been suggested it was the season15 version with the pattern repeated - or even the promotional scarf which was worn for a variety of photo shoots and personal appearances. Eitherway, that coat, waistcoat and scarf don't belong together! I was casually watching tv tonight and up came an ad break. Only half paying attention, I saw a new commercial for Kellogg's Crunch Nut Chocolate Flakes. 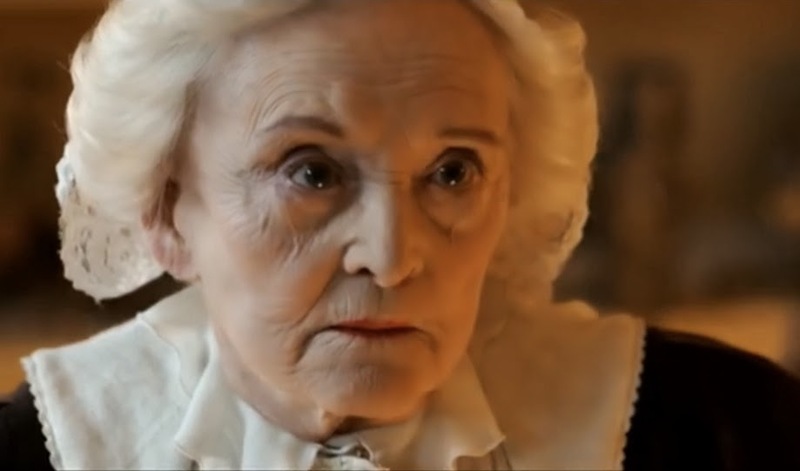 My attention was suddenly piqued when halfway through an elderly shop keeper popped up played by none other than legendary Doctor Who costume designer June Hudson! 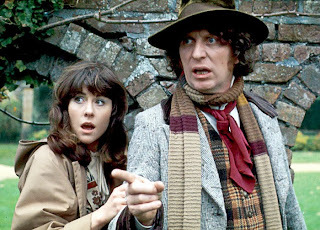 While researching the Fourth Doctor Costume Index, I did come across some great photos of Tom in costume - but not for broadcast episodes. One set which really catches the eye were taken for the Doctor Who greetings cards printed in the late 1970s by Denis Alan. I am not 100% sure, but I wouldn’t be surprised to hear they were taken while on location filming for Destiny Of The Daleks. The sandy background reminds me a lot of the landing site of the Movellan ship and the costume looks to be a match to what he wore for that adventure. Each of the 17 cards had a different message inside, only one is included here. It wouldn’t take a genius to print their own birthday cards from these.